A shoddy Central Coast wedding photographer has been confronted by Channel Nine’s A Current Affair, with several angry bride clients claiming they were ripped off. Couples said they paid Allamanda Gentle upwards of $1500 to capture their wedding, but the photographer either didn’t show up, canceled on the day, or failed to deliver images. On the day of her wedding a client named Jasmine said Allamanda’s husband called, claiming they had a serious car accident and were unable to make the wedding. However, NSW Ambulance and NSW Police have no record of an accident that morning. In another incident, involving clients Wendi and Micka, the photographer requested a notice in the wedding invite to refrain guests from taking photos. The guests respectfully obeyed. Two months later, Wendi hadn’t received the photos and tried to call Allamanda. Her phone had been disconnected, and Wendi discovered a new number online. She called Allamanda, who claimed the photos were lost in the mail and she would send them again. Nothing arrived, with Australia Post again blamed. After one last attempt, Allamanda promised to personally drop the photos off to Wendi’s sister the next day. When they didn’t arrive Wendi’s sister tried to call Allamanda, but her number had been blocked. So Wendi has no photos from the day! 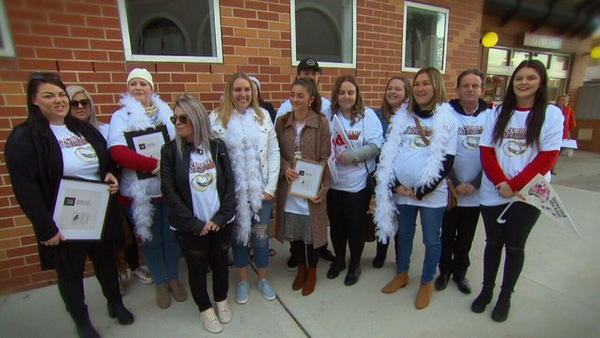 In classic ACA style, reporter Lauren Golman assembled the ‘bridal brigade’ and drove them around The Entrance main streets in a flashy vintage fire engine, while they chanted ‘we want our photos’. Onlookers were visibly confused by the stunt. Eventually they reached their destination – Allamanda’s house. Unfortunately for viewers, there was no heated confrontation or ‘gotcha moment’. Lauren thumped on the door, asking Allamanda to face her clients. Allamanda called the cops. But, after a ACA stake out, Lauren ambushed the photographer, who was caught running from her car to the house in her pjs. ACA also had accusations by clients against an unrelated Central Coast videography business, Switch Multimedia. Allamanda Gentle has operated several photography businesses with different names, and also runs a web design company. Allamanda previously went by Amanda Gentle, and has been listed on various business directories since 2014 as ‘Wedding Photographer Central Coast’, ‘The Event Photographer’, and ‘Photos On The Coast’. Each business lists the same ABN number. This is the only link connecting Allamanda and Amanda, other than the two photographers sharing similar names and living at The Entrance. Some of the businesses have either disappeared or been stripped back. There’s abandoned Twitters and 500px accounts, blogs, as well as half-finished WordPress websites. There’s no explanation why so many businesses have been created and abandoned, or why Amanda transitioned to Allamanda. The online business directory listings through EasyWeddings and Service Seeking receive five and four star ratings, with the most recent coming in February 2017. While it’s possible some reviews are fake, there’s the odd criticism and a variety of writing styles. However three more recent Google reviews from the past 12 months for Wedding Photographer Central Coast are less enthusiastic. ‘Booked and paid for her services for our wedding and without any warning she failed to turn up. I still have not been able to make contact with her to arrange a refund of our money. Phone goes to answering machine and emails are bouncing back. Allamanda’s ABN is also linked to another business, Spot On Web Design, which was rebranded to OzMonkey in 2013. This business has been active since 2011. Considering several brides claimed they were scammed on ACA, it’s surprising Allamanda’s reputation has remained unscathed since 2014. It seems that things have only gone awry recently. ProCounter is now a veteran of ‘wedding photographers gone bad’ stories and usually they are rich with negative news articles, bad public reviews and complaints, dedicated Facebook groups, and so on. Regardless, the wedding photo industry has been done yet another disservice. Read about more wedding photographers behaving badly here, here, here, here, here, and here.